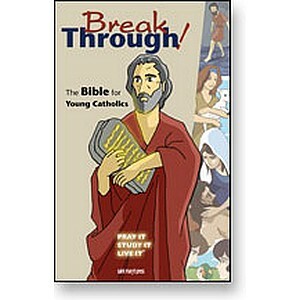 The Breakthrough Bible is created for young people leaving childhood and entering adolescence. 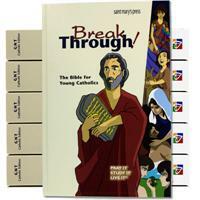 The stories of the great people of the Bible are told in engaging, full color inserts. Readers will see God breaking through in human history relating to the human family for thousands of years.The message of the Bible and God’s message for us is clearly presented in a way that adolescents will want to read. Engage the youngster in your life in scripture and the stories of the people of the Bible. This edition is the Good News Translation (Today’s English Version) with an Imprimatur making it easy to read and enjoy. Spiralbound Manual for Teachers for the Breakthrough Bible Workbook for the immensely popular Breakthrough Bible aimed at reaching young people from 10-14 with colorful artwork, engaging stories about the people of the Bible and relating our faith story. 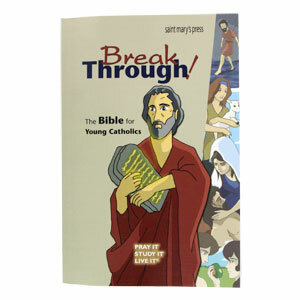 Workbook for the immensely popular Breakthrough Bible aimed at reaching young people from 10-14 with colorful artwork, engaging stories about the people of the Bible and relating our faith story.